Today I'm welcoming a new visitor to the blog. Alice Isakova has written a sequel to Pride & Prejudice, Georgiana Darcy: A Sequel to Jane Austen's Pride and Prejudice. 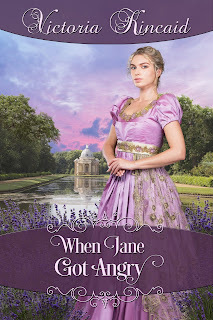 She's come here today with an excerpt and giveaway! Let's read the blurb, and then I'll hand over to Alice. With her temptingly large dowry, the beautiful and talented Georgiana Darcy catches the eye of numerous suitors, not all of whom wish to marry purely for love. As Georgiana navigates the treacherous waters of courtship, her story becomes intertwined with that of Anne de Bourgh, her wealthy but painfully awkward cousin, who stirs up trouble when she sets her sights on a young gentleman with a rank far below her own. In so doing, Anne encounters the opposition of her proud and domineering mother, the formidable Lady Catherine de Bourgh, and sets in motion a chain of events that brings a damaging secret to light and threatens to destroy Georgiana's dreams of happiness. Intrigues, gossip, and elopements further complicate Georgiana's efforts to find love and avoid the snares of fortune-hunters. 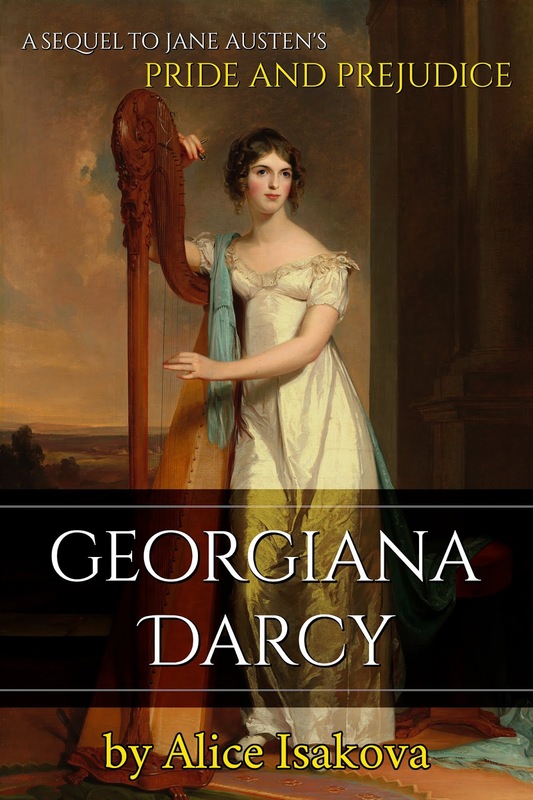 Written in a sparkling, witty, humorous style on par with Jane Austen's own in Pride and Prejudice, Alice Isakova's Georgiana Darcy continues the tale that has delighted readers for over two centuries. 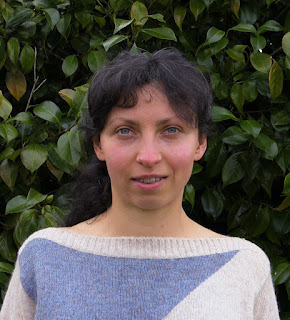 Hello readers, and thank you, Ceri, for having me as a guest on your blog. 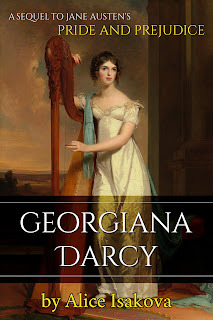 I am really excited to share my debut novel Georgiana Darcy with all of you. The following is an excerpt from chapter eleven of my book, in which Georgiana learns how to waltz with the help of Sir Matthew Leigh, a young gentleman vying for her heart. Hearing Georgiana practicing on the pianoforte, Sir Matthew Leigh smiled to himself, and with a book in hand, he followed the sound to the drawing room. "I hope I am not disturbing you, Miss Darcy," said he upon entering. "No, not in the least. I am practicing some new music, that is all. It is a difficult piece, and I have not yet mastered it, but if you do not mind hearing my mistakes, you are welcome to stay." "I am always glad of an opportunity to hear you play, Miss Darcy—even your mistakes are charming." Sir Matthew settled into a chair and opened his book, but it is doubtful whether he profited at all from the volume, for half the time his eyes were directed at Georgiana rather than at the page before him. At last, the gentleman dropped all pretence of reading and came towards the pianoforte. Leaning his elbows on the instrument, he looked into Georgiana's eyes deeply until she cast them down shyly to the keys below. Yet, the slight smile on her lips gave proof that she did not find these attentions displeasing. "What are you thinking of now, Miss Darcy?" asked Sir Matthew softly. "I was just remembering the ball we attended on Friday… the dancing—it was such a happy evening." "And you would like to dance again now, perhaps?" "Well, yes—only, of course, the next ball will not be for some time," came Georgiana's answer. "Must we really wait that long? We could dance here, right now." "What, just you and I, right now?" "But Sir Matthew, consider," laughed Georgiana, "What kind of dance will it be with just two people? The English country dance and the quadrille are designed to be performed by several couples at once. It will not be the same with only one couple." "Perhaps if the English country dance or the quadrille is what you have in mind, but we could try something else instead, such as… Miss Darcy, do you know the waltz?" "I have heard it mentioned—it is popular in Germany, I believe." "It originated in Germany, yes, but the waltz has since spread to other parts of Europe, and recently it was introduced in England. The advantage of the waltz is that it can be performed as successfully by one couple as by several together. When I was last in London, I learned the steps of the French waltz—I could teach you if you like." "Oh no, I think it would be better if you did not. Though I know little of the waltz, I have heard that it is not a very proper dance." Raising himself back up to a standing position, Sir Matthew answered, "Doubtless, that is the opinion of some stuffy, old clergyman of the Puritan persuasion. When the dance is better known in England, I am certain that it will become widely accepted. Miss Darcy, I have seen the waltz, and I can assure you that it is a very beautiful dance—here, if you will stand up, I can show you." "The dance begins with a short march, which leads into the first part—the slow waltz. The next part is the sauteuse, which is faster and consists of a series of springs and leaps. Last of all is the jetté, which is faster still. Would you like me to show you the march steps first, Miss Darcy?" "Then let us begin. Instead of facing each other, we start with standing side by side, and we face in the same direction, like this. Now, I will reach my arm across behind you and place my hand on the back of your shoulder—and you do the same." The next thing Georgiana felt was the electric sensation of Sir Matthew's arm encircling her shoulders. Hesitantly, she followed suit by lifting her own arm and placing it on the back part of his shoulder. "Now, Miss Darcy, we must bring the outer arm around to the front so that we may join hands." Georgiana obediently but tremulously placed her hand in his. "Next, we take four steps forward: one… two… three… four." Georgiana had always considered dancing, regardless of what kind, to be a romantic, exciting amusement, but neither the English country dance, nor the Scotch reel, nor the quadrille was anything like this. With Sir Matthew's arm on her shoulder, and her arm on his, they were essentially in an embrace. She had never danced so close to a man before—he was so near, in fact, that she could hear his breathing and feel his warmth. All this was somewhat foreign to her sense of female delicacy, but she had no wish to pull away, although the thought kept returning to her mind that perhaps she should. "Now I make a half-turn to face you, and then we step so that we are again positioned side by side, only this time, we will be facing in opposite directions. From here, we encircle each other's waists from the front with one arm, and with the other, we join our hands above our heads in the form of an arc." "And our feet? What do we do with them?" "With our feet, we perform the pas de bourrée step, and at the same time, we turn together in a circle. But even more important is what we do with our eyes; in the waltz, while revolving about their own axis, the partners must look into each other's eyes without breaking the gaze." Georgina did her best to comply, but at last she could bear it no longer, and laughing softly, she turned her face away. "No, no, Miss Darcy, do not look away! We must dance the waltz properly!" The maiden forced her clear orbs back to his, and with their eyes thus fixed on each other, they turned slowly in a rotating embrace. Although there was no music to accompany their dance, both felt then, and remembered their time together afterwards, almost as if there really had been music; the moment was perfect as it was. Thank you so much to Alice for visiting us today. I wish you all the very best of luck with your book! 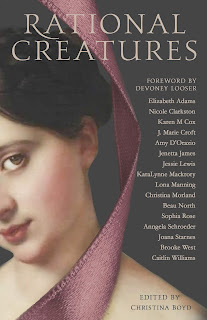 Today the blog tour for the anthology Rational Creatures stops by. This is the the third anthology brought to you by The Quill Collective, brought together by editor Christina Boyd (see also The Darcy Monologues and Dangerous to Know: Jane Austen's Rakes and Gentlemen Rogues). Some of my favourite Austenesque authors have contributed short stories to this collection, which focuses on the ladies in Austen's works. 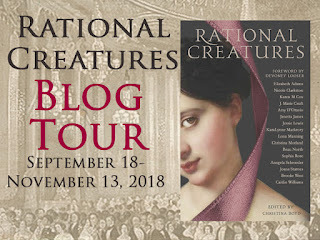 I'm happy to be welcoming author Elizabeth Adams here to chat with me about rational creatures in general, and in particular Persuasion's Anne Elliot, the character in Elizabeth's story. There's a fantastic giveaway accompanying the blog tour too. Let's read the blurb, and then we'll move on to my interview with Elizabeth Adams. Now, let's get on with my plans for October. I have some good visits on the horizon. 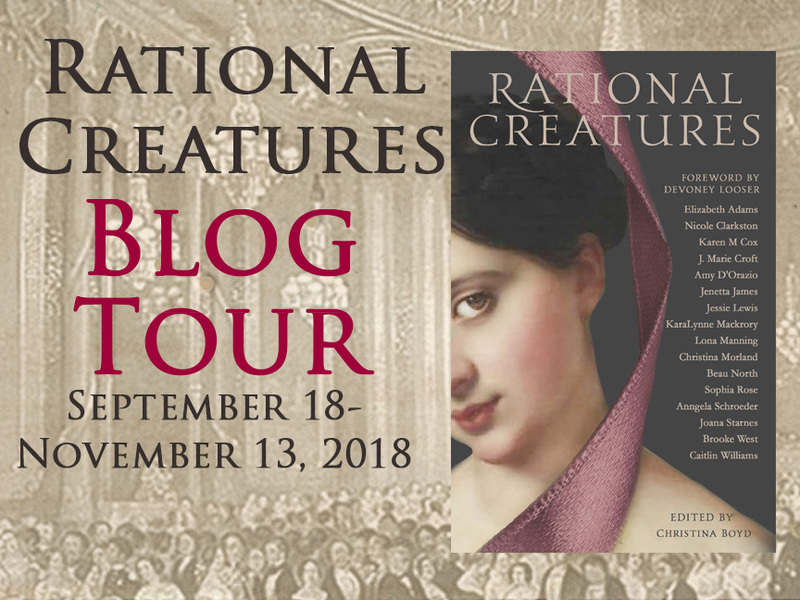 Firstly, the blog tour for Rational Creatures stops by. 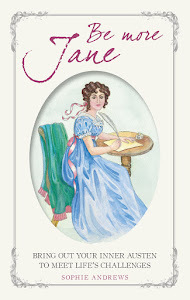 This is another anthology from the Quill Ink Collective, following on from The Darcy Monologues and Dangerous to Know: Jane Austen's Rakes and Gentlemen Rogues. This time, the focus is on Austen's ladies. I will be welcoming one of the authors from the anthology, and plan to read the book too. 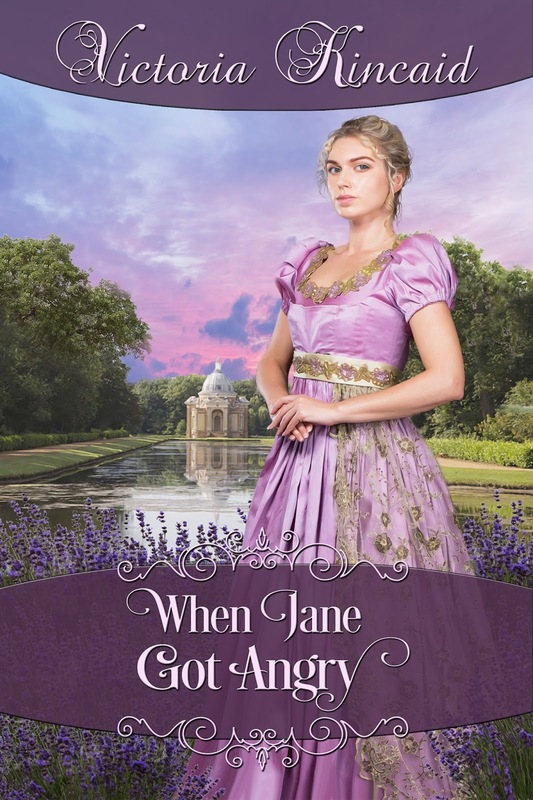 I also hope to welcome Victoria Kincaid back to the blog with her latest story, a novelette called When Jane Got Angry - Jane in this case being Bennet. I can't imagine it, as she seems so serene, but I am looking forward to learning more about the story. 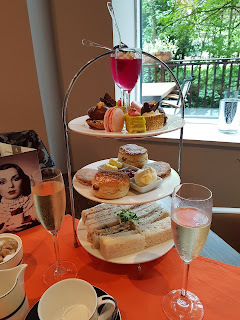 I'll be welcoming Alice Isakova to the blog for the first time, with her book: Georgiana Darcy: A Sequel to Jane Austen's Pride and Prejudice. I haven't read many sequels to Austen's works, so will be interested to see what this author has in store for us. 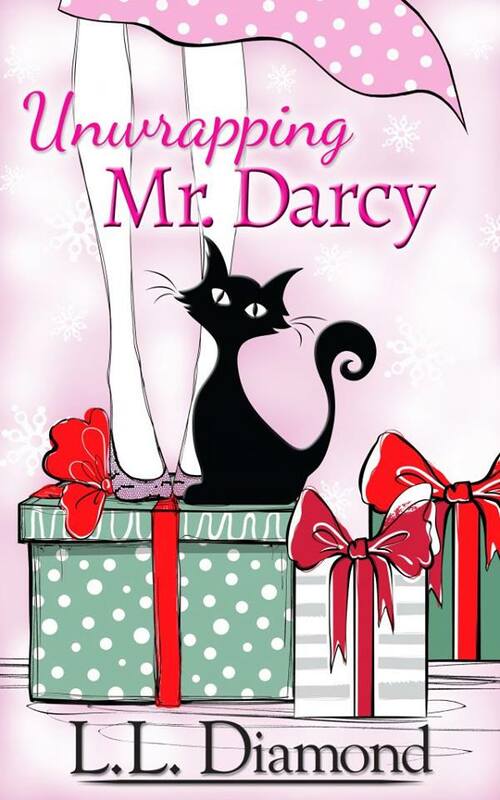 L L Diamond will be visiting late on in the month with a book with a festive flavour; Unwrapping Mr Darcy. All I know about this book is that it has a Christmas theme and features a black cat! 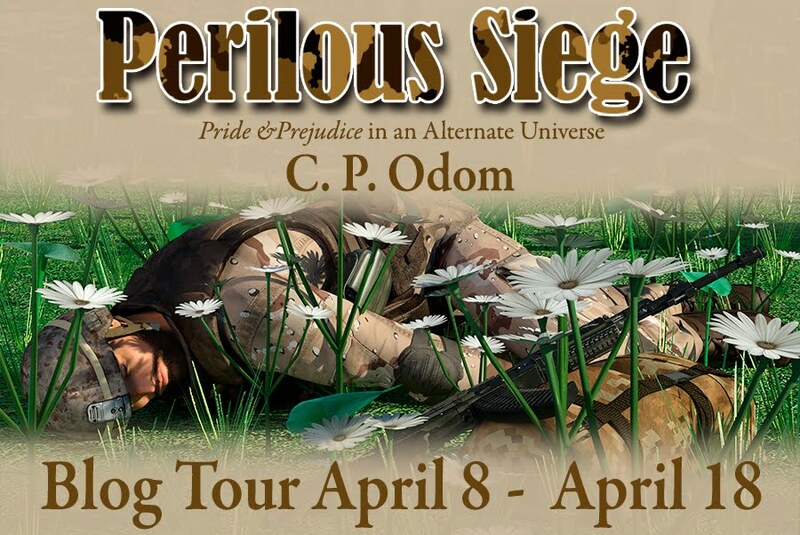 I'm also hoping to take a look at Melanie Rachel's upcoming Pride & Prejudice variation. Phew! Busy month! I hope you can join me for these posts. I'd love to know what you've got planned to read this month, and if you've read anything recently that you'd like to recommend. Please let us know in the comments!